I know I'm hitting you guys over the head with shoes lately, but we've been eating, sleeping, and breathing shoes here, and I feel obliged to keep you informed. 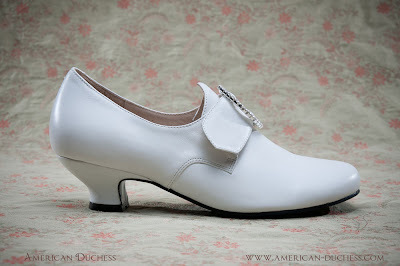 The Georgianas I currently have in stock are now all listed as "WIDE" on the website (http://www.american-duchess.com/shoe-shop/costume-shoes/georgiana-18th-century-shoe) . If you have wide feet, these are the shoes for you, but don't wait to order - I have only about 25 pairs left, and am already out of 6s, 7s, 7.5s, and 8s. Once again, we must achieve at least 100 orders for Devonshires or Georgianas to make the run. If we don't reach that goal, I must refund everyone who did buy their shoes and cancel the order. So please tweet, share, re-post, and spread the news to your friends that August 1st is the day. Of course, when you order between August 1 and 10, you get the reduced price ($100 instead of $120). You can order as many shoes as you like, whichever sizes you need. Delivery will be in October, just around the corner, and in time for Halloween, holiday events, and well in preparation for next year's Summer season. So mark your calendars: AUGUST 1, and go to www.american-duchess.com to have a look at the goodies. Thank you so much for catching this. You will notice I've altered it already, after a long conversation about shoe sizing, with the factory. This is the correct sizing chart. I am not provided with widths at this time, but I will ask for them. Can't wait for the 1st of August!